A new Oppo smartphone with model number PBFM30 was recently spotted on Chinese certification site TENAA revealing full specifications of the device. 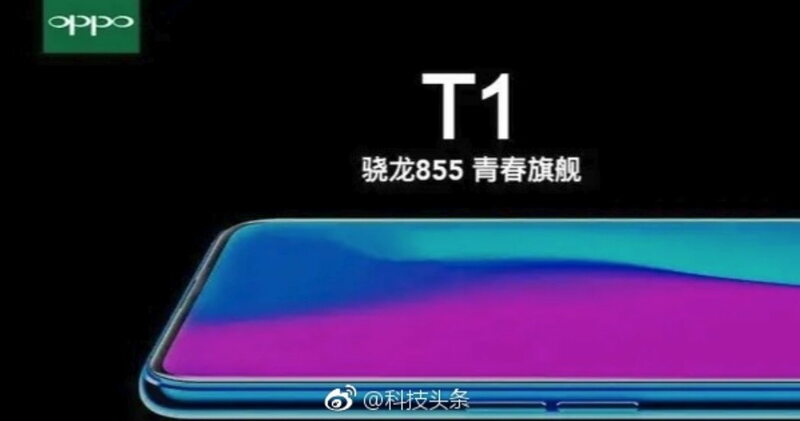 Now a new Oppo device Allegedly called the Oppo T1 has appeared on Chinese social media site Weibo. The image shared on the Weibo shows an Oppo device which appears to have a full-view display. The leaked Oppo T1 appears to be a flagship smartphone that will come equipped with Snapdragon 855 SoC. The leaked Oppo T1 device appears to have a curved edges and two side buttons on the left. However, the images didn’t reveal any other details about the device. Maybe this is the device, which Oppo recently reported to be showcasing on its 2019 Innovation Event. Last month Oppo reported to be holding its 2019 Innovation Event on February 23rd in Barcelona at MWC 2019. The report had suggested that Oppo will showcase its two new technologies at its Innovation event. The first is the ‘Triple camera seamlessly enables 10x zoom’. The technology will use three cameras including an “Ultra Wide Angle + Ultra Clear Master and a Telephoto lens”. As of now, we don’t know much about the alleged Oppo T1 smartphone. More you can read in our previous post on, What to Expect from Oppo 2019 Innovation Event on February 23rd.